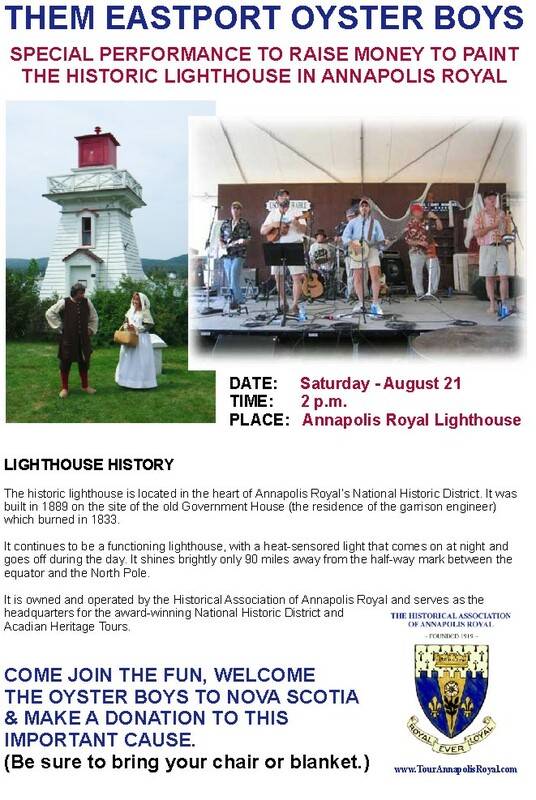 Them Eastport Oyster Boys will be performing at the lighthouse in Annapolis Royal, Nova Scotia, on Saturday, Aug. 21 at 2 p.m. to help raise money to paint this beautiful historic structure. Come join the fun, welcome the Oyster Boys to Nova Scotia, and make a donation to this important cause. Located in the heart of Annapolis Royal’s National Historic District, the historic lighthouse was built in 1889. It continues to be a functioning lighthouse, with a heat-sensor light that comes on at night and goes off during the day. It shines brightly only about 90 miles away from the half-way mark between the equator and the North Pole. This entry was posted in Explore Annapolis Royal, Heritage, Lighthouse Preservation and tagged Annapolis Royal, Historical Association of Annapolis Royal, Lighthouse Preservation, Lighthouses, Nova Scotia, Nova Scotia Lighthouses. Bookmark the permalink.